When I first began my yoga practice, I was still in the “no pain, no gain” mentality from my years teaching high-impact aerobics. That attitude, combined with my frustration trying to kick up into Sirsasana (Headstand) one day, led to a tumble on the mat and intermittent neck pain that has stayed with me almost eight years later. 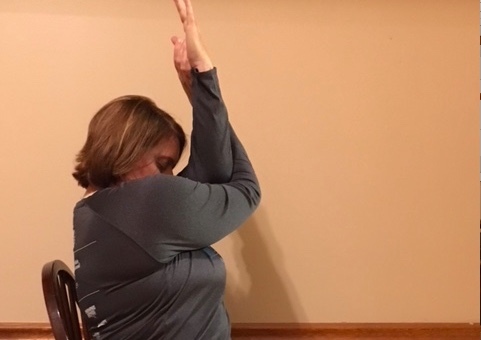 Although a poor yoga attitude combined with lack of skill and preparation led to an injury, I have since improved both my attitude and my skills to learn how yoga can also heal old injuries. The National Institutes of Health reports that non-specific neck pain affects about two-thirds of all people, usually around middle age. Although acute neck pain usually resolves within a couple weeks, neck pain becomes chronic in about 10 percent of sufferers. Neck and shoulder pain often overlap, due to referred pain via the numerous nerve pathways connecting the neck and shoulders. The connective soft tissue between the neck and shoulders also tends to confuse the specific primary injury or source of pain. The most common cause of shoulder pain and neck pain is an injury to the soft tissues, including the muscles, tendons, and ligaments within these structures. Spending hours in front of a computer or smartphone with poor postural alignment is another factor in the rise of neck and shoulder pain. As the spine slumps forward, the shoulder blades slide apart, both overstretching and weakening the surrounding muscles. Those weakened muscles are more likely to experience painful tightness along the shoulder blades and up into the neck. Common treatments for both neck and shoulder pain include rest, ice and over-the-counter non-steroidal anti-inflammatories such as ibuprofen. However, severe or worsening pain or numbness and weakness in the extremities require a doctor’s evaluation. Yoga is often recommended as an evidence-based additional therapy intervention for back and neck pain. In addition to its benefits as a movement modality, yoga seems to improve body awareness, pain acceptance and coping. Overarching the neck in backbends. Instead of cuing my students to look up, which can cause hyperextension of the cervical spine, I encourage them to look no higher than where the wall meets the ceiling. In Salabhasana (Locust Pose), Bhujangasana (Cobra Pose) or Urdva Mukha Svanasana (Upward Facing Dog Pose), students should keep their neck neutral or their gaze to the floor in front of the mat. Hunching of the shoulders in Virabhadrasana I (Warrior I Pose). Remind students to keep shoulders away from the ears and to slightly externally rotate the arms to open the chest and shoulders. Rounded shoulders with hands clasped behind the back. In chest expansion poses, encourage students to slightly bend the elbows rather than pushing their knuckles back. Pushing clasped hands back tends to pull the shoulder inward, whereas bent elbows create external rotation. Alternately, they can hold onto a yoga strap with their hands shoulder-width apart. 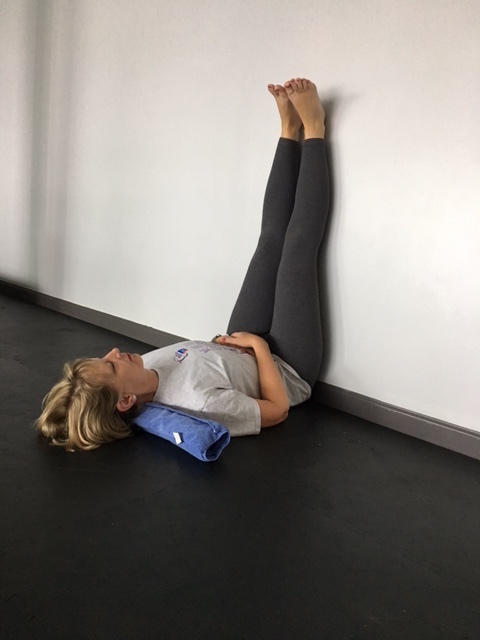 Inversions such as Sirsasana (Headstand Pose) and Sarvangasana (Shoulderstand Pose) should only be attempted when the student has practiced proper prep poses and has the adequate strength to hold the pose. 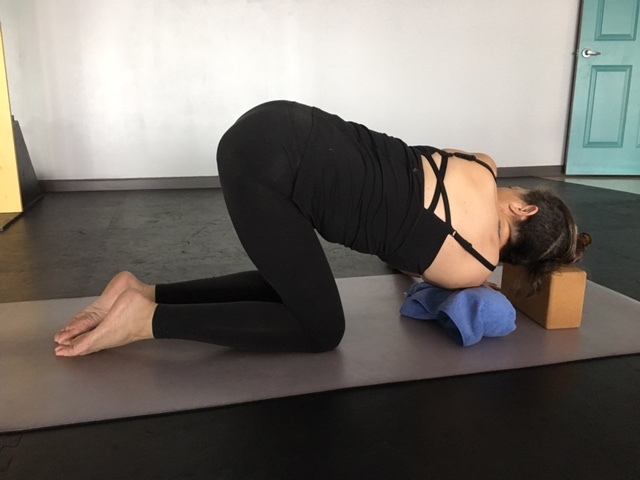 Neck support in Shoulderstand can be accomplished with extra folded blankets placed under the shoulders and the head on the floor. 1. 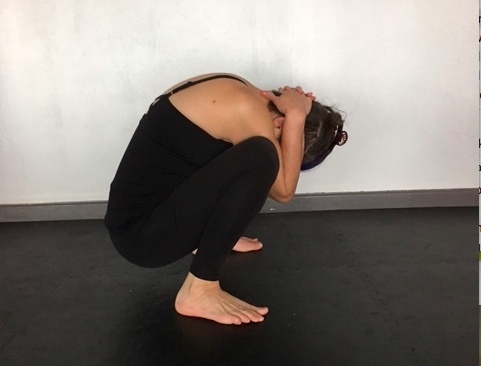 Garudasana Arms with Chin Tilt: From any comfortable seated position, bring your arms together into Eagle Arms to stretch the rhomboids and lower trapezius muscles. Slightly tilting the chin to the chest in the pose allows the stretch to reach deeper into the scalene muscles which run along both sides of the neck. 2. Malasana with Neck Pull: From Malasana, drop your chin to your chest, allowing your back to round. Interlace your hands gently at the base of your neck. Never pull your head down, rather hold firmly encouraging your neck to release. 3. Parsva Balasana: Thread-the-Needle Pose is great for opening the upper and outer muscles of the shoulder as well as sending freshly oxygenated blood to the upper extremities. As with all twisting asanas, move gently and carefully through the full extension. Placing a rolled up towel, small pillow or neck roll under the neck for additional support will encourage the neck muscles to relax. 4. Shoulder Opener on Blocks: Place two blocks shoulder-width apart at the front of the mat. Beginning in a kneeling all-fours position, place your elbows on the blocks. Bring the hands into Anjali Mudra, and then slowly lower the head down between the blocks. Ideally, the hands rest in Reverse Prayer Position on your back. You will look as if you are in a modified Balasana (Child’s Pose). If the shoulders are too tight, use an additional block for support under the forehead. 5. 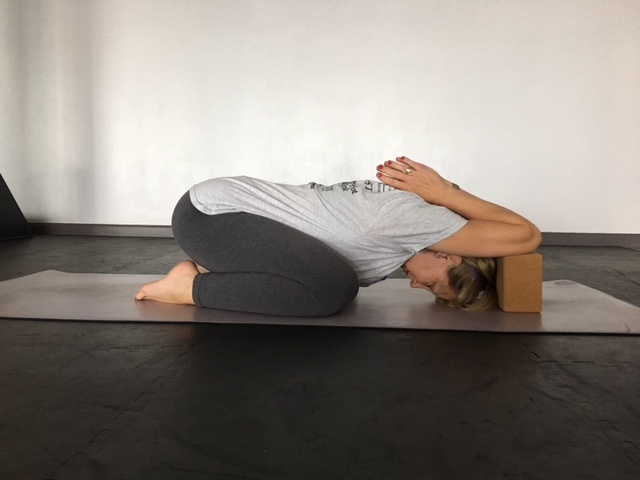 Matsyasana with Support: From a seated position with knees bent, place one block horizontally between your shoulder blades. Place the second block vertically under the head for support. 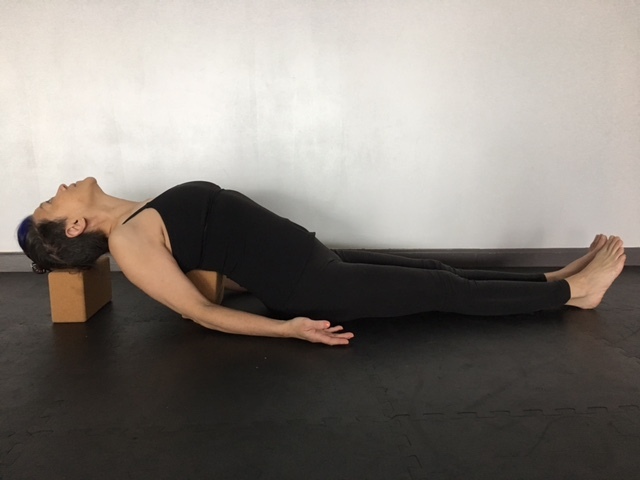 This restorative version of Fish Pose can take a little bit of adjusting to get the blocks into the best most relaxing position. Allow the arms to rest palm up along the sides of the body. 6. Viparita Karani with Neck Support: Place a rolled-up towel, neck roll or blanket under the neck for additional support. Filling the space between the cervical arch and the floor allows the muscles to relax and release. 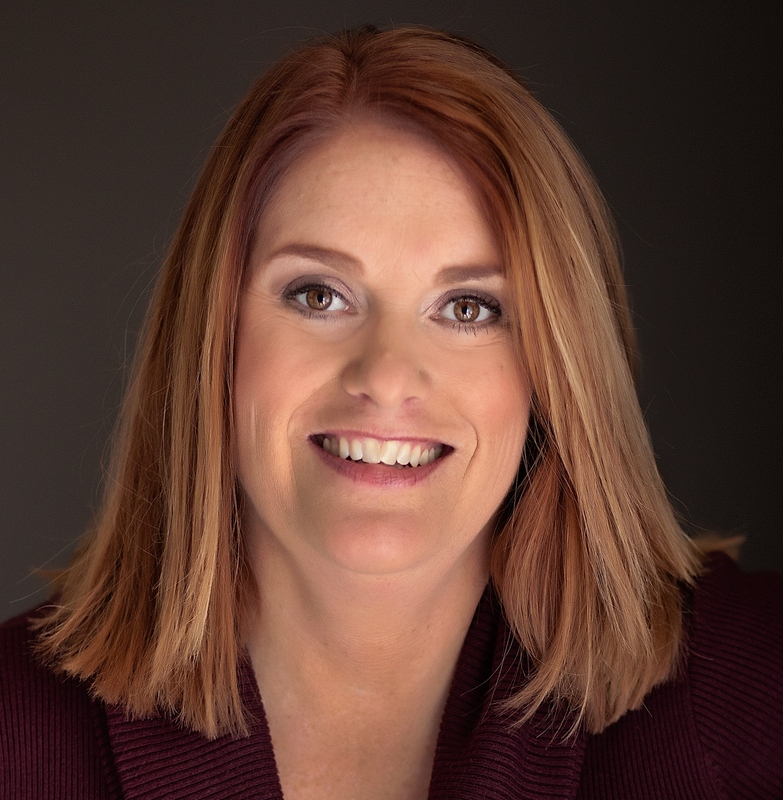 Another article on yoga and neck care from YogaUOnline and Christine Malossi - Enhancing Body Awareness: 5 Ways to Nurture Your Neck in Your Yoga Practice. Study neck health and why it matters with YogaUOnline and teacher, Doug Keller on The Wisdom of Jalandhara Bandha.